Oil prices declined significantly this week. Prices had surged in the lead-up to May 25’s OPEC meeting. The meeting concluded with a nine-month extension to the existing production cut agreement, yet the market apparently had wished for deeper and more immediate cuts. WTI is back below the $47.50/b level, and has fallen below $47/b this morning. WTI opened at $48.04/b today, a drop of $0.59, or 1.21%, below yesterday’s opening price. The week is heading for an end in the red. WTI crude prices opened the week at $49.93/b. WTI opened this session at $48.04/b, a drop of $1.89, or 3.8%, from Tuesday’s opening. During the week, prices ranged from a low of $46.74/b Friday morning to a high of $50.28/b on Tuesday, a range of $3.54. Current prices are $47.39/b, down significantly by $0.97 below yesterday’s closing price. Diesel prices opened Tuesday at $1.5621/gallon. 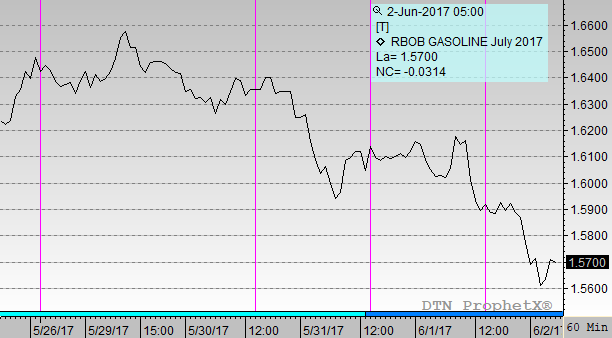 Diesel opened this morning at $1.5001/gallon, a significant drop of 6.2 cents, or 4.0% for the week. Prices ranged from a low of $1.4634/gallon on Friday to a high of $1.5786/gallon on Tuesday, a huge price range of 11.52 cents. Current prices are $1.4816/gallon, down by 2.01 cents from yesterday’s closing price. Gasoline prices opened Tuesday at $1.6416/gallon. Gasoline opened today at $1.5921/gallon, a drop of 4.95 cents, or 3.0%, for the week. Prices ranged from a low of $1.5545/gallon on Friday to a high of $1.66/gallon on Tuesday, a large range of 10.55 cents. Prices are $1.5724/gallon currently, a continued fall of 2.9 cents from yesterday’s close. On the U.S. side, the supply and demand data were constructive last week. The Energy Information Administration (EIA) reported the largest crude inventory drawdown of the year, 6.428 mmbbls. Crude inventories have decreased for the last eight weeks. The EIA also reported a gasoline stock draw of 2.858 mmbbls, and a diesel stock build of 0.394 mmbbls. The EIA reported that U.S. crude supply expanded by 22 kbpd during the week ended May 26. This brought total production to 9,342 kbpd, the highest level since August 2015. Crude imports fell, while crude exports rose. Crude inputs to refining rose by 229 kbpd. Apparent demand for gasoline rose by 118 kbpd during the week, bringing demand to its highest level on record. Naturally, the weekly data are known to show more variability than the finalized monthly data, which is published with a two-month delay. Gasoline demand this year still is below last year’s levels. The weekly data placed average May 2016 gasoline demand at 9,661.3 kbpd, around 64.8 kbpd higher than the May 2017 apparent demand of 9,596.5 kbpd. Weekly diesel demand fell by 344 kbpd, and jet fuel demand fell by 44 kbpd. It is possible that the Trump administration’s action to withdraw from the 2015 Paris climate accord is being interpreted as something akin to a free-for-all on the coal, oil and gas production side. The administration supports growth in U.S. production of fossil energy, and this would drive prices down further. In all, the weekly fundamentals from the EIA were solid, but investors were not at all tempted to bid prices up. Indeed, without some sort of market tightening, analysts may once again start noting technical support levels for the next downward price correction. 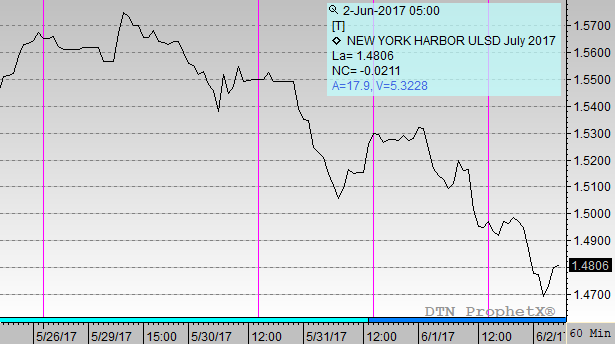 Recall that as recently as May 5th, WTI opened at $45.51/b. What stands in the way of a return to this price?